The contributing finalists in this friendly competition will receive a 6 oz. 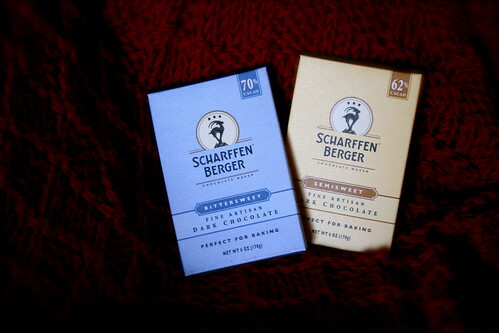 brick of Scharffen Berger Fine Artisan Dark Chocolate (Perfect for Baking) in their choice of 62 or 70% cacao. So Lori J. (Food with Flair...it is, rather!) and Joan M. (Kibbe et al...simultaneously cute and intelligent-sounding! ), I'll be in contact with you to find out which % you'd prefer...If you need ideas on what to do with your newly acquired chocolate, check out www.epicurious.com or www.scharffenberger.com. Good stuff over there! And now, dear readers, I have a confession to make. I feel quite sheepish as I write, and as though a fair-blogging rulebook should be thrown at me. You see, as you may have noticed, there were only two finalists awarded with chocolate, and as you will no doubt recollect, there were five distinct entries in the poll (audience murmurs, putting 2 + 2 together). Here's what happened: the Scientist and I were discussing good blog names one night before the competition began, and we both decided to enter it ourselves, just to see...and the entry which won the popular vote was, er, mine! And I didn't even vote for it! My husband says I'm weird for being upset that my own entry won, and I have to agree, in a weird sort of way. But he's used to it now, I think. Or at least, he's getting used to it. And I love him for it. So since tomorrow is his birthday, I'll whip something chocolaty up for him as his prize. As for me, well, I've got this newly-re-christened blog, I've got the Scientist, and *hopefully* you'll all keep reading, and that's more than enough for me. Actually, I didn't vote for mine either! And Joe was supposed to cast his vote for the same one, but there was some confusion and he thought I cast his vote for him. Btw, can I put in a plug for that excellent chocolate? My name is Beth too! And I live on the East Coast... Pennsylvania to be exact. Thanks for checking out my blog. I'm now putzing around yours! Well, hi, Beth! Thanks for stopping by and commenting. If you like to live on chocolate, try PW's chocolate sheet cake...it's awesome! Hi JCM! Plug away, girl! Glad you liked it. And thanks for entering and voting in the contest. Guess you guys aren't living by the rule of "vote early and vote often", but that's probably ok. Hugs!